After 9/11 the world changed. There is no sense in even arguing that. The world seemed to shift, and it seemed our country lost a bit of its innocence. For the first time I could remember in my life, my country was headed to war. I was in 6th grade, and I was sitting in Social Studies class. I think it was at that point that I knew that I wanted to be a historical educator, which is what I studied in college. But for the first time in awhile, somebody struck American soil, something that is deemed forbidden by us, something that never happens to us. What was bizarre about post-9/11 and what still gives the War on Terror debate a slippery slope is the enemy. The War on Terror is like WWII, where it was clear that Nazi Germany was the enemy. The terrorists are country-less, unknown, hard to find, which has made this war a challenge. Soon after 9/11, our government passes The PATRIOT Act, which partially gives our government agencies more freedom to find terrorists worldwide. That means tapping into cell phones, the internet and other means of digital media and communication. Some believe it to be important towards the fight against terrorism, others believe we as a country gave up some of our freedom for more security. No matter which part of the political spectrum you fall under, I think its safe to say that both the right and the left have used and possibly benefitted from The PATRIOT Act. The thing is, is this act really the right course to take in the future, especially when we are spying on our own citizens? Or are we really spying on our own citizens? I can't name how many times I have called a business and been told that my call could be recorded. In a world where anybody could be an enemy of the state, can we really be too careful? This is kind of what "Citizenfour" is about, examining counter-surveillance of our nation and trying to find out if we are loosing civil liberties because of it. Documentarian Laura Poitras has been investigating our country's work since that fateful day in September 2001, and she eventually came across an e-mail written by the mysterious Citizenfour, saying they had very valuable information regarding our country's counter-surveillance. 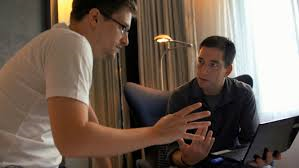 They agree to meet in Hong Kong to discuss this issue, and it is revealed that Citizenfour is Edward Snowden. Snowden was a computer professional who worked for the CIA, and he leaked classified information from the NSA to the mainstream media in 2013. This documentary is about that leakage. The documentarians spend a week in Hong Kong with Snowden. Snowden discusses what he has found, why he chose to come forward with what he found and the fallout of leaking such information. No matter how I have described the events of this movie, it isn't something that is trying to sell you an agenda. I know it seems unbelievable, but it is the truth. This is a movie where we literally get to see history unfold, that barely happens. Even in the richest of documentaries do we actually get the opportunity to watch history unfold. No matter how you vote every few years, I think you will find "Citizenfour" to be quite the eye-opener. I believe in the mission of our country to find the terrorists responsible for 9/11 and prevent another catastrophe in the future. At the same time, I have always been a very private person. The government being able to tap into my life without my permission bothers me. Sometimes I wonder about what our founding fathers would think of some of our decision making if they had the opportunity to travel through time. I am very laissez-faire when it comes to government, I don't think we should give them an over-abundance of power, and if "Citizenfour" is any indicator, there could a lot going on that they are not telling us, and lots of spying on all of us that we are unaware of. I think whether or not you believe in this or not, I think "Citizenfour" is thought-provoking and quite thrilling for a documentary. I think it stands a pretty decent chance of winning Best Documentary on Sunday. I usually never get political on this blog, and I apologize for doing so tonight, I just love being pulverized by a film. "Citizenfour" will definitely have you thinking about it afterward, and I think that was the point all along.